Danger Dogg turned 5 years old on September 19. Though I'm only about two months behind blogging about our fun day, we celebrated with a day of fun festivities! It's impossible to imagine our fun little family without him. As I mentioned in my last post, we haven't yet covered our heater vents. We are planning on buying authentic cast iron covers - but they cost a pretty penny and it always seems like there is something else taking precedence. In the meantime, Danger discovered what fun it is to deposit his favorite toys into the abyss and aimlessly search for them around the house; it doesn't seem to thwart him that they are never recovered. 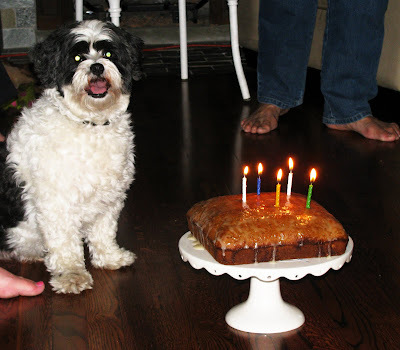 Most of his favorite toys were lost the same day of his party, but once that project was complete we ended with a tasty sour cream cake for Danger and Tipsy, and Cheesecake smothered in fresh raspberries for the humans. Bake in a 9x9 square cake pan at F350° 45-50 minutes, until cake springs back to the touch.